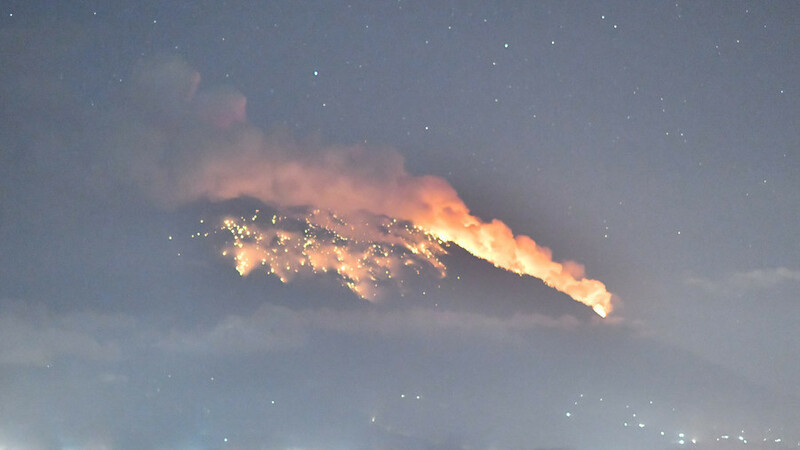 Residents reported hearing a loud explosion as Mount Agung flung volcanic rocks at least 2 km in the air. A sea of lava spewed from the crater, which ignited nearby vegetation. Indonesia’s National Agency for Disaster Countermeasure (BNPB) said the explosions began just after 9pm local time and that the ash column was seen as high as 2,000 meters above Mount Agung’s peak. The volcano, situated in the northeast of the island, has experienced seismic activity and eruptions since last year. In November authorities ordered the evacuation of as many as 100,000 people after the volcano erupted less than two times in a week. All air traffic at the island’s international airport was also halted leaving thousands of passengers stranded. The airport temporarily closed again on Friday, as a precautionary measure. Mount Agung is only 49 km from the island’s capital of Denpasar, and some 980 km from the country’s capital of Jakarta. Bali is located on the Pacific Ring of Fire, consisting of 450 volcanoes and earthquake activity.